NAPLES, FL (September 2016) – Interested in taking a getaway? Then you should consider heading to the AAA Four-Diamond The Naples Beach Hotel & Golf Club in Southwest Florida. 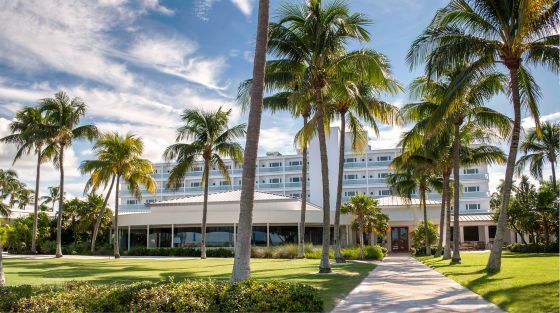 Set on 125 lush acres, complemented by seven miles of pristine white sandy beach, the 319-room resort is Southwest Florida’s only resort directly on the beach with an on-site championship golf course, a world-class spa, and an award-winning tennis center. Want more reason to visit? The resort will complete the dramatic renovation – almost reinvention – of its championship golf course this November. The resort’s course is being redesigned with input from golf icon and acclaimed course designer Jack Nicklaus, who has a historical tie to the resort. The Jack Nicklaus redesign is being done in collaboration with noted course architect John Sanford of Sanford Golf Design. This major $9 million project follows $50 million in impressive renovations and enhancements at the resort over the last few years. The total redesign of the resort’s course began in April, and the entire project will be complete this November, with the course fully operational and reopening on November 17, 2016, according to the beachfront resort’s General Manager Jason Parsons. According to Parsons, this is almost a month ahead of schedule. Jack Nicklaus is helping to celebrate his past and that of The Naples Beach Hotel & Golf Club by reshaping the future of this iconic golf course. It was in 1951, on a family vacation to Naples, Florida, and a friendly round of golf alongside his father, that the Ohio native accomplished the very impressive feat of first breaking 40 over nine holes on the resort’s course, shooting a 37. At just 11 years old, he came within a shot of shooting par, and just one year after he picked up golf clubs for the first time. This round, in particular, is what drew Nicklaus to the project–the scorecard is even archived in the Jack Nicklaus Museum, the 24,000-square-foot facility on the campus of The Ohio State University. The resort’s golf course brings together two of the world’s finest designers, who celebrated the grand opening of their collaboration on Trump Golf Links at Ferry Point in the Bronx, New York, in 2015. Sanford served as project manager for the Jack Nicklaus Signature Golf Course, and among the many honors bestowed on the design, it was named to Golf Digest’s Best New Courses 2015 and recognized by Golf Magazine as the Best New Course You Can Play. It was also a top-three global selection by Golf Inc. as Development of the Year. In addition to the new course, the resort has added a 300-yard practice and teaching range, and will have new golf carts with GPS tracking systems to aid golfers with yardages on each hole, thus helping pace of play. Rich in hospitality and tradition, The Naples Beach Hotel & Golf Club has been part of the Naples community since 1946. Owned and operated by the Watkins family for three generations, the resort also features: 1,000 feet of soft white-sand beach; the world-class spa; a fitness center; the Mary C. Watkins Tennis Center with six Har-Tru courts; Beach Kids Club, a complimentary daily recreational program for children ages 5 to 12; retail shops; beach rentals; 34,000 square feet of meeting space; and a variety of picturesque outdoor venues for receptions and events. In addition, the resort features multiple restaurants and lounges. The selection includes: the signature beachfront restaurant HB’s on the Gulf; Broadwell’s, serving breakfast daily and providing panoramic views of the golf course; and the Seminole Store, which serves deli sandwiches, ice cream, gourmet coffees and a variety of freshly baked pizza, pastries and desserts in a café atmosphere. The Sunset Beach Bar & Grill has been recognized as the “Best Place To View A Southwest Florida Sunset,” and was named “Naples’ Best Beach Bar” by Travel Channel. Providing a comfortable and friendly atmosphere, the resort is an exceptional tropical getaway. Guests always benefit from no resort fees, complimentary self-parking and valet parking, and complimentary access to the resort’s fitness center. The resort is located at 851 Gulf Shore Blvd. North in Naples, Florida. 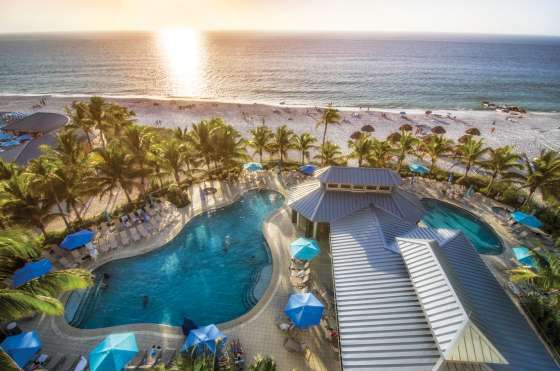 For reservations or for information about rates, contact the resort’s Reservations Department at (800) 237-7600 or (239) 261-2222, and visit NaplesBeachHotel.com . For golf rates and tee time information, as the course will be open to the public, contact the resort’s Golf Pro Shop at (239) 435-2475. (HILTON HEAD, S.C.) – Hilton Head Golf Island (HHGI) – voted the “No. 1 Island in the Continental U.S.” by Travel + Leisure magazine readers – is offering golfers an array of exceptional stay-and-play packages for getaways to long savor. At Palmetto Dunes, the Players Golf Special starts at $410 per person. It includes three nights’ stay in a two-bedroom villa, two rounds on the Robert Trent Jones, George Fazio or Arthur Hills courses (plus free replays), logoed-hat and golf balls as well as dining discounts. For reservations and more information, call 877.567.6513. For 12 or more players, the Sea Pines Resort’s Group Package starts at $199 (per person, per night) and includes three rounds of golf on the famed Harbour Town Golf Links, Heron Point by Pete Dye or Atlantic Dunes by Davis Love III (the island’s newest layout), three nights’ deluxe villa accommodations, resort gift card, personal on-site coordinator, complimentary green fees for afternoon replays and the group organizer plays for free. For reservations and more information, call 843.842.1488. Ideal for 12 or more golfers, Heritage Golf Group’s Lowcountry Group Special starts at $185 per night. It offers three nights’ accommodations, a Lowcountry boil at Lagerhead Tavern, and three rounds of golf with unlimited replays on any of the Heritage Golf Collection’s excellent courses including the recently Pete Dye-renovated Robber’s Row. With numerous courses for players of all abilities, exceptional value, pleasant year-round weather and direct flights from more than 20 major cities, Hilton Head Island is one of the world’s premier golf destinations. In addition to being named the International Association of Golf Tour Operators’ 2016 North American “Golf Destination of the Year”, Hilton Head Island has received recent accolades from Golfweek, Golf Channel’s Golf Advisor and the South Carolina Golf Course Rating Panel. Getting to “Golf Island” is easier than ever from East Coast and Midwest population centers. JetBlue Airways operates non-stop flights from Boston (BOS) and New York City (LGA / JFK) to Savannah / Hilton Head International Airport (SAV). Allegiant Air also flies non-stop from Indianapolis (IND), Cincinnati (CVG), Baltimore (BWI) and Pittsburgh (PIT), among others cities. Fourteen other locales offer non-stop service to SAV including Chicago, Detroit, Dallas/Fort Worth, Houston, Philadelphia and Washington D.C.
For additional information about rates, restrictions and other package inclusions, or to receive a quote: www.hiltonheadgolfisland.org, 800.523.3373. Raleigh, NC, September 30, 2016 … The PGA Value Guide, the National Standard for Golf Club Values™, today announced a Fall Trade-In Blitz program that will run the entire month of October at valueguide.pga.com. Thanks to a flood of great golf club technology in the marketplace and strong trade-in values, golfers can access the PGA Value Guide to find the fair market trade-in value for their current clubs and help offset the cost of a new equipment purchase. As part of the October Fall Trade-In Blitz, golfers visiting the PGA Value Guide will receive an extra 20% on the value of their existing clubs toward the purchase of new clubs. In fact, the PGA Value Guide website offers a convenient online trade-in tool which allows golfers to print a free shipping label, ship their clubs in and receive cash or credit for their trade-ins. Golfers can then visit any one of over 5,000 PGA Professional-staffed facilities in the PGA Trade-In Network where they redeem their cash or credit towards the purchase of new properly-fit golf equipment from the top brands in golf. Just like determining the resale value of a preowned vehicle, the PGA Value Guide provides a detailed valuation of existing equipment for trade-in. Consumers have a mechanism to make an easy, turn-key new product purchase. Today, the PGA Value Guide features everything from benefits to reviews, product specifications to pricing. It is recognized as THE Source for providing current fair market values for all golf clubs, as well as in-depth research and information on new equipment in the market. For more information on the PGA Value Guide’s Fall Trade-In Blitz, visit valueguide.pga.com. 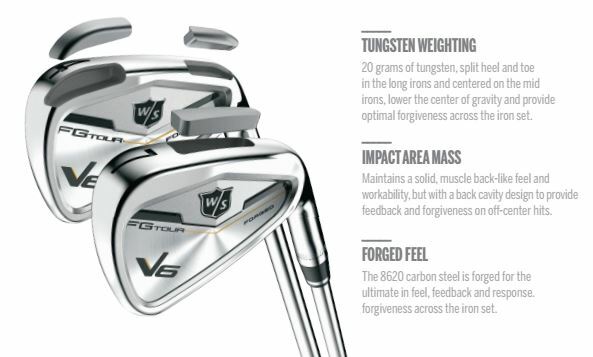 Wilson Golf unveils the newest addition to the award- winning FG Tour line, the Wilson Staff FG Tour V6 Irons. The newly added 20-gram tungsten insert is built to increase launch angle without increasing spin rate, which adds forgiveness in the long irons. This makes for a well-balanced and consistent iron with accuracy, impact stability, and generous distance. The insert on the split heel and toe on the 3, 4, 5 irons and centered on the 6, 7 irons. in the long irons and centered on the mid irons, lower the center of gravity and provide optimal forgiveness across the iron set. and accessories. Wilson Golf is a global leader in high performance golf equipment and uses player insights to design products that push golf innovation into new territories. Through its dedication to creating products that enable athletes at every level to perform at their best, Wilson has earned its place as a leader in sporting goods for over a century. ATLANTA – (Sept. 21, 2016) – At a celebration at Turner Field, Mizuno and the Atlanta Braves announced a long-term partnership that will include the opening of a one-of-a-kind Mizuno Experience Center in The Battery Atlanta. 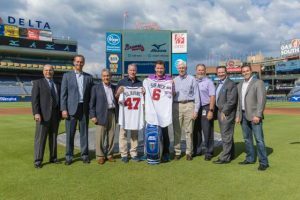 The agreement makes Mizuno the Official Baseball Gear Partner of the Atlanta Braves, reaching beyond on-the-field engagement opportunities with the team and spreading into fan activities and community investments throughout Atlanta and the Southeast. As the Official Baseball Gear Partner of the Atlanta Braves, Mizuno also will be pioneering multiple first-of-its-kind baseball glove kiosks inside SunTrust Park where fans can check out Mizuno baseball gloves to catch foul balls during the game. Fans will be able to return the gloves at no cost or purchase them at the end of the game. The Mizuno Experience Center will be an immersive, fan-focused environment that will enable visitors to test a variety of Mizuno performance technologies, such as Mizuno Golf’s Performance Fitting System and the Bat Interactive Optimization System (BIOS) for bat fitting along with showcasing its premium gear across baseball, golf, running, softball, volleyball and more. · Opportunity to showcase the brand’s heritage, craftsmanship, innovation and technology shaping the gear, from master craftsman visits, PGA Tour truck appearances, and advanced exclusives of the latest gear. Mizuno’s engagement will not be limited to baseball, as it will fully integrate its golf and running sub-brands into several Braves events. For instance, Mizuno will be the participating sponsor of the annual Braves Country 5K and Braves Foundation Golf Classic. “Through this partnership we have the ability to showcase the entire breadth and depth of Mizuno – our heritage, craftsmanship, innovation and technology behind our gear, while also becoming an integral part of the fan experience. This is a long-term commitment that further embeds Mizuno into the Atlanta community, and we are excited about the many new opportunities to come as a result,” said Puccini. Mizuno USA, Inc. is a wholly owned subsidiary of Mizuno Corporation, one of the largest specialty sporting goods manufacturers in the world. Mizuno USA, Inc. manufactures and distributes golf, baseball, softball, running, and volleyball equipment, apparel, and footwear for North America. Mizuno USA, Inc. based in greater Atlanta, Ga. The Saltire Festival is back for 2016 to celebrate St. Andrews Day and the Home of the Flag bringing together people from all over the world to celebrate Scotland’s fascinating heritage, wonderful culture, delicious food & drink traditions, best of Scottish music, arts, food & drink, innovation and entertainment. To celebrate, there are a number of exciting events taking place around the county, everything from Horse Racing and Night Golf, to Music and Comedy. We are delighted to announce our programme of events for this year’s Saltire Festival taking place from 24-30 November, details below. The festival ties in with the national Year of Innovation, Architecture and Design and there will be some interesting lighting effects appearing on key landmarks and festival venues across the county as part of the #SaltireBlue tour – to highlight both East Lothian’s great attractions and its architectural wonders. This includes the Kelpie Maquettes which will be hosted at Musselburgh Racecoure and will be lit blue for visitors to admire. The maquettes were scale models of the Kelpies used as a construction guide for the full-size versions which are on permanent display at Helix Park in Falkirk. Other venues and landmarks to be announced! Enjoy a day of racing at one of UK’s most stylish racecourses. Showing of the movie ‘Trainspotting’. A chance to refresh your memory of the cult classic film based on Irvine Welsh’s novel, ahead of the release of Trainspotting 2. Step back to the Victorian age, when tourists flock along the new railway to explore the battlefield made famous in Walter Scott’s hit novel Waverley! Tours are FREE! Part of the Foxlake Fox Trail Running Series – a 10k night run with competitors asked to dress in Tartan and run through the forest lit blue to celebrate St. Andrew’s Day. An evening of delicious, locally sourced produce accompanied by Scotland’s national drink. A fun family Scottish ceilidh with the ‘Smoking Barrel Ceildih Band’ accompanied by a locally sourced Scottish supper. An evening of entertainment compared by The Big Yin Revisited and headlined by ‘Simple Minded’ supported by local musical talent. Using LED balls and markers, this technological innovation opens up a whole new experience of Scotland’s national game. A social night of fun, encouraging golfer’s of all abilities to get involved. An evening headlined by Treacherous Orchestra, supported by Skerryvore and local musical talent. A celebration of all of East Lothian and Scotland’s local produce, accompanied by cookery demonstrations and ides of how to create your very own St. Andrew’s menu. Tickets – £6 available in person from Haddington Wines, Joe Forte Sports & Hilary’s Deli. Historical re-enactors, with performances and workshops throughout the day telling the tale of Scotland’s history and how our innovations impacted the world. An afternoon and evening of Scottish comedy from 2pm to 9pm in a beautiful setting with spectacular views of the Bass Rock. A fun day for all the family concluding with a spectacular fireworks display! Comedy Club 4Kids – Featuring children’s entertainment. A key Scottish speaker hosted in one of East Lothian’s most unique venues. A selection of choral and classical music performances to conclude the festival. Featuring performances from Alex Hodgson, Uke Can Do It, East Lothian Schools Orchestra and Preston Lodge Ceilidh Band. Los Angeles, CA — Sept. 8, 2016 – We Are The Mighty (WATM), the military’s media and entertainment brand, and Marine Corps veteran, actor and comedian Rob Riggle present the inaugural Rob Riggle InVETational Golf Classic. The veteran-celebrity golf tournament will raise money and awareness for the Semper Fi Fund. We Are The Mighty Presents: The Rob Riggle 2016 InVETational Golf Classic will take place at the world-class Valencia Country Club in Los Angeles on Dec. 5, 2016. In anticipation of the event, Riggle and Chris Bowers, veteran and Purple Heart recipient, filmed a series of comedic golf sketches, two of which were released today: Rob Riggle Sniper Golf Coach and Rob Riggle Cheats at Golf for Semper Fi Fund. During this high-octane golf tourney, veteran and celebrity teams will contend for the lowest scores and most laughs to raise funds and awareness for the renowned Semper Fi Fund, one of our nation’s most respected veteran nonprofits. Semper Fi Fund provides immediate and lifetime support to post-9/11 critically ill and injured service members from all branches of the military. Since inception, Semper Fi Fund has assisted over 16,800 service members and their families totaling more than $133 million in assistance. Semper Fi (“always faithful”) is the motto for the U.S. Marine Corps. Semper Fi Fund’s goal is to always be there faithfully helping heroes in need. Best known for his roles in The Hangover, 21 & 22 Jump Street, Dumb and Dumber To, The Other Guys, Step Brothers, The Daily Show, Modern Family, among other popular movies and TV shows, tournament host Rob Riggle served 23 years in the U.S. Marine Corps and Reserves as a Civil Affairs Officer and Public Affairs Officer across the globe, including in Afghanistan. Riggle cares deeply about our veterans and has used his success as a comedian and actor to support those who have served our country. 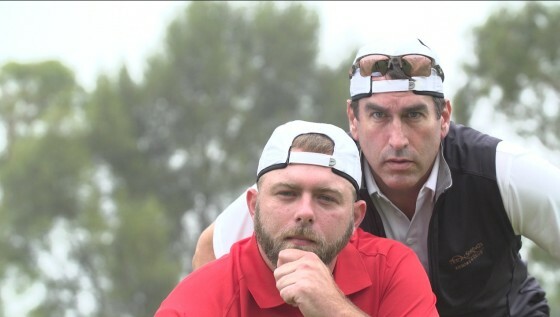 We Are The Mighty presents The Rob Riggle InVETational Golf Classic in conjunction with charity golf tournament expert Bob Levey of Independent Events & Media. The tournament will be featured on www.wearethemighty.com and shared via WATM, Riggle and Semper Fi Fund social media feeds. Follow the hashtag #InVETational for updates. Celebrity participants and veteran golfers from Semper Fi Fund’s athletics program will be announced in the coming weeks. We Are The Mighty (WATM) is the military community’s premier media and entertainment brand serving 133 million-strong American servicemembers, their families and those who support them. Our team of veterans and media professionals captures the diverse voice of our audience with great stories and quality content, innovative marketing and ground breaking events. As brand-builders, content creators and influencers, We Are The Mighty works with companies, nonprofits, government agencies, and anyone looking to reach this broad and loyal market. For more information, go towww.wearethemighty.com, Facebook, Twitter and Instagram. The Semper Fi Fund provides urgently needed resources and lifetime support for wounded, critically ill and injured members of the U.S. Armed Forces and their families. Case managers from the Semper Fi Fund work one-on-one with service members and veterans in order to understand and support their individual needs right now and throughout their lifetime. We keep our overhead low so that each donation has the greatest impact on the lives of service members and veterans. The Semper Fi Fund is one of only two veteran charities to receive an “A+” rating from The American Institute of Philanthropy and a four-star rating from Charity Navigator. Learn more at www.semperfifund.org, Facebook, Twitter, and Instagram.